The John Gosden-trained Roaring Lion just got the better of Aidan O'Brien's Nelson as he supplemented wins at this track and Kempton to take the Group Two spoils. Nelson and Mildenberger jointly made the running, with Midnight Wilde keeping them company until he was outclassed as they approached the bushes. 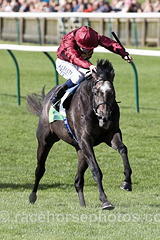 At that point, Roaring Lion (11-4) burst on the scene under Oisin Murphy and he dug deep to outpoint Nelson by a neck, with Mildenberger third. Roaring Lion was given a quote of 20-1 for the Derby with Ladbrokes . Murphy said: "I was still on the bridle passing the bushes, so I couldn't have sat any longer. "We went a good gallop and he travelled like a really nice horse. I must be the luckiest young lad in the world riding horses like this. "I haven't ridden a Derby horse in a while, so I'm not sure if he is one or not, but he certainly has a big future." Winning owner Sheikh Fahad said: "John has done a great job with the horse and Oisin has ridden him brilliantly there. "He travels well, so it's exciting. You've got to dream. It's great to go into the winter with a horse like him."